Hannah Kearney’s quest to become the first freestyle skier to win back-to-back gold medals was upset by not just one, but two Dufour-Lapointe sisters from Canada. 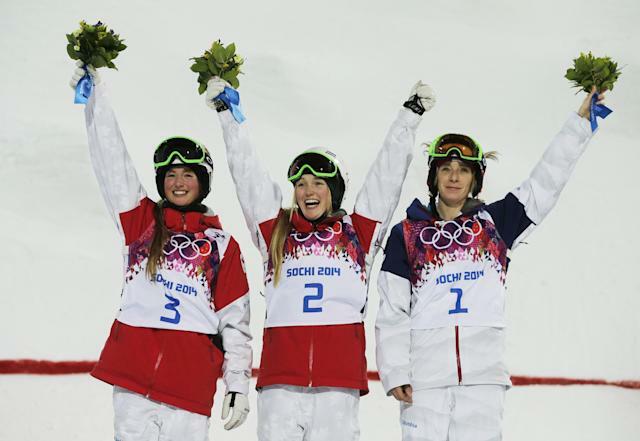 A popular story from the Sochi Games, freestyle skiing had a sister act with Justine (19), Chloe (22) and Maxime (24) all competing for Team Canada in the women’s moguls competition. There was talk of the sisters sweeping the podium, but with reigning gold medalist Kearney competing, this was certainly not expected. Oldest sister Maxime did not qualify for the final with only the top six skiers competing, but Justine was able to capture gold with a score of 22.44, well ahead of Chloe who scored 21.66 to earn a silver medal. Canada now has a medal of every color at the beginning of the games, with Mark McMorris taking bronze in the inaugural snowboarding slopestyle event. It was a familiar situation for Hannah Kearney, who qualified for the finals as the top skier and thus competed last. At the 2010 Vancouver games, hometown favorite Jennifer Heil was sitting in first place with a score of 25.69 and just one skier left to compete – Kearney. With the pressure on, Kearney skied a clean run and snatched the gold medal from the Canadian. In Sochi, Kearney again attempted to knock a Canadian skier off of the top of the podium, but was unable to do so this time. Kearney bumped around a bit on her run but did ski well enough to land her a bronze medal. Kearney first competed in the 2006 Turin games, but didn’t make it into the finals. Chloe’s first Olympics appearance was in Vancouver, while sisters Justine and Maxime made their debut in Sochi.